Sundarbans National Park is a UNESCO World Heritage Site in Southeast Bengal in India. Sundarbans National Park is in the South 24 Parganas of West Bengal, India. The meaning of the Bengali word sundarban is "beautiful forest". Also please keep in mind that Sundarbans is a plastic free zone. Please do not throw used/unused plastic into this environment. Keep them with you or in a waste basket. There is a relentless effort of making this beautiful place clean, please help to achieve it by not dumping garbage all around. Try reading The Hungry Tide by Amitav Ghosh before embarking on the trip. It will surely add an extra-dimension to your senses. 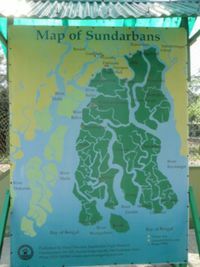 The Sundarbans are the largest littoral mangrove belt in the world, stretching 80km (50mi) into the Bangladeshi and Indian hinterland from the coast. The Sundarbans has been declared a UNESCO World Heritage Site. The part of the forest within Indian territory is called Sundarbans National Park. The forests aren't just mangrove swamps though — they include some of the last remaining stands of the mighty jungles which once covered the Gangetic plain. The Sundarbans cover an area of 3,850 sq km, of which about one-third is covered in water/marsh areas. Since 1966 the Sundarbans have been a wildlife sanctuary, and it is estimated that there are now 400 Royal Bengal tigers and about 30,000 spotted deer in the area. The forest is called 'Sunderban'due to the rich growth of Sundari trees. Royal Bengal tiger, saltwater crocodiles, deer, birds, bull sharks, various primates and snakes. 1. The movement of boats is less since a lot of people avoid that time because of the season. However, the positive is that chances of sighting wildlife is more. 2. The cloudy sky and the lovely sunset is the best time for photography. Sundarbans National Park is located in the south eastern fringe of the Indian state of West Bengal and part of Sundarbans Reserve Forest. The adjacent inhabited areas of the Indian part of Sundarban are well connected with Kolkata by both roads and railways. And Kolkata is well connected with big cities in India by road, rail and air. Kolkata is also connected with Bangkok, Singapore, Hongkong, Kathmandu, Dhaka etc. by air. Godkhali located just opposite Gosaba Island and Gosaba is the last inhabited islands towards Sajnekhali Wild life sanctuary and Sundarban Tiger project area of Sundarban reserve forest. The shortest route distance to Godkhali port from Kolkata is 82km and it is 95km from Kolkata airport (Netaji Subhas Chandra Bose International Airport). One can travel directly from Kolkata by road or can travel by train from Sealdah to Canning and travel by road from Canning to reach Godkhali. Koikhali is nearer to the Haliday wildlife sanctuary and tourist attractions like Bonnie camp, Kalas Island and beach, Haliday Island etc. Koikhali is 83 and 92km away from Kolkata and Kolkata airport respectively. Namkhana is 117km away from Kolkata and 123km from Kolkata Airport. Namkhana is also connected with railway from Kolkata and the distance is 109km. This place is closer to Bhagabatpur crocodile project and Lothian wildlife sanctuary of Sundarban. Canning is the nearest railhead to Sundarban Tiger Reserve. Railway distance from Kolkata to Canning is 45km and 29km away from Godkhali Port. It takes 1hr 20mins to reach Canning station from Sealdah station in Kolkata. Public transport is available between Canning and Godkhali port. You can reserve a vehicle (Tata Magic) directly to Godkhali from Canning for ₹600-700 per vehicle (Feb 2014). In case a direct vehicle is not available, you can reach Godkhali via Sonakhali. There are bus and auto rickshaw services from Canning to Sonakhali and Sonakshi to Godkhali. The easiest way to reach Sundarbans is the Canning route. Buses are also available from Kolkata(KC Das at Esplanade, Sealdah Bus stand or Science City) to get to Sonakhali or till Malancha from where you get another bus to Sonakhali. Foreigners wishing to visit the Sundarbans have to obtain a special permit. This is mandatory as per Government rules. It can now, however, be obtained at the Sajnekhali Forest Office(Ecotourism Range). The originals have to be shown to the forest office on your arrival. Tourism Centre, West Bengal Tourism Development Corporation Limited, 3/2-BBD Bag (Near Great Eastern Hotel), Kolkata. ☎+91 33 2210-3199, +91 33 2248-8271. A permit for maximum 5 days is usually granted which can be further extended subject to the permission of local forest officer. All these can be covered in varying lengths of time; in a 1N 2D package you may be able to cover 2 - 3 watch towers, in the 2N 3D package you may be able to cover a few more and so on. Most of the watchtowers offer panoramic views of the landscape but can get pretty crowded. A good alternative is to skip the watchtowers and cruise along the numerous less frequented channels and soak in the landscape. Apart from cruising around the tourism zone of National Park, take a village walk. Visit a local school. Go on a cycle trip to the local village market. Know more about the unique Mangrove Eco System. Join a fishing or crab catching expedition on a country boat around the village(you are not allowed to do that inside the Reserve Forest). Take a birding walk around the village. Join a cooking class, and learn how a local dish is prepared with simple local ingredients. Experience a local cultural programme Bonobibi Pala - a local rural dance drama performed by the villagers, though now it has become mostly a tourist fad. Experience and be entertained by the "Jhumur /Tribal dance"
Fresh sea fish, prawns, lobster, dry fish curry, cottage cheese, pancake, rice pudding (Bengali dessert). Filtered or boiled water (do not insist on mineral water unless it is a part of your personal medication. Mineral water comes in plastic bottles. Sundarbans is a No-Plastic Zone.) Fresh coconut juice. Fresh watermelon juice. Mango juice. WARNING: To avoid the unsavoury, corrupt, and thoroughly untrustworthy booking services based in Kolkata, it is best to get a place to stay on arrival without advance reservation. Sunder Chital Tourist Lodge, Sajnekhali, belonging to West Bengal Tourism Development Corporation Ltd. 30 double bedrooms, ₹3500+Tax (approx Rs. 4500/- as on Jan'15 / Only Lodging + Pickup & drop from tourist lodge to Godkhali) including Morning Tea. Dormitory, ₹250 per bed including breakfast +1 meal. No air-con. It is the only lodge close to Sajnekhali Forest Beat Office and one can get the perfect jungle feeling. Sunderban Tiger Camp, Dayapur Island, National Park East Range. City Office: 9, Mitter House, 71, Ganesh Chandra Avenue, Second Floor, Kolkata. ☎ +91 32 935749, +91 93 3109 2632, +91 98 3117 0453, ([email protected]). The only Star Classified Government Approved Luxury Forest Resort in West Bengal. In the heart of Sunderbans and amidst a sprawling 9 acres of green land opposite Sajnekhali Tiger Reserve Forest. A boutique resort providing conference facilities and accommodations include tents, huts, and luxury air-conditioned cottages and rooms, all with attached baths, tea/coffee maker, bar and various recreational activities both in-house and outside. Meals served buffet-style with vegetarian and non-vegetarian options. Sightseeing tours by boat. The air-conditioned cottages and rooms have solar water heaters and the other accommodation have attached clean bathrooms with running cold water and hot water on request and very well sanitised. Houseboat in Sundarban, M.B India Beacons, Sajnekhali, Sundarban ☎ +91 33 2419 1976 ☎ +91 990 329 5920, A houseboat with 2 rooms sufficient to accommodate 3 + 4 = 7 persons. Well furnished rooms, not cabins. A unique experience of cruising during the day and staying in the middle of the river at night. If you are backpacking, go to Godhkhali/Pakhirala and inquire about the boats. They are generally cheaper, but there is always the risk that you may not get one on the weekend and important dates and have to abandon your tour from there. Overnight stay on the boat, is possible and is a unique experience.However, check out the HYGIENE and SAFETY of the boat before you do so. Most of the BOATS HAVE SINGLE TOILETS and the toilets on the boats stink and may not be so clean as most of the boats carry maximum no of passengers ( 25, 35, 40 or maybe 60) as per their Licensed capacity during the day and all those passengers use onboard bathrooms. However, if you find one such nice boat, the experience of an overnight stay on the boat and the scenic beauty of the dawn on the water is absolutely breathtaking and mesmerizing. The Sundarbans is the only place in the world where tigers still actively hunt humans for food and usually between 50 and 80 locals are mauled each year. The Royal Bengal Tiger is extremely dangerous in the Sundarbans, but most visitors need not worry since wildlife tours and accommodation that is provided by the state government, as well as the State Government, recognised/authorised agents will never put you in harm's way. However, if you are interested in private tours (by hiring a small boat with an outboard motor or so), do it at your own risk! Always insist or enquire whether the boat you would be travelling in has life jackets, as well as fire extinguishers as those are prerequisite safety measures (MOST OF THE BOATS DO NOT HAVE THEM.) So be very careful in planning your trip in small boats. The Sundarbans is also home to a population of Saltwater Crocodiles (Crocodylus porosus) and Bullsharks are found throughout the estuaries, so swimming is not advised anywhere. This page was last edited on 21 January 2018, at 04:27.